1 Peel papayas and cut into quarters lengthwise. Core flesh and cut crosswise into about 5 mm (approximately 1/4-inch) thick slices. Place in a large bowl. 2 Rinse and peel cucumbers, cut in half lengthwise and remove seeds with a spoon. 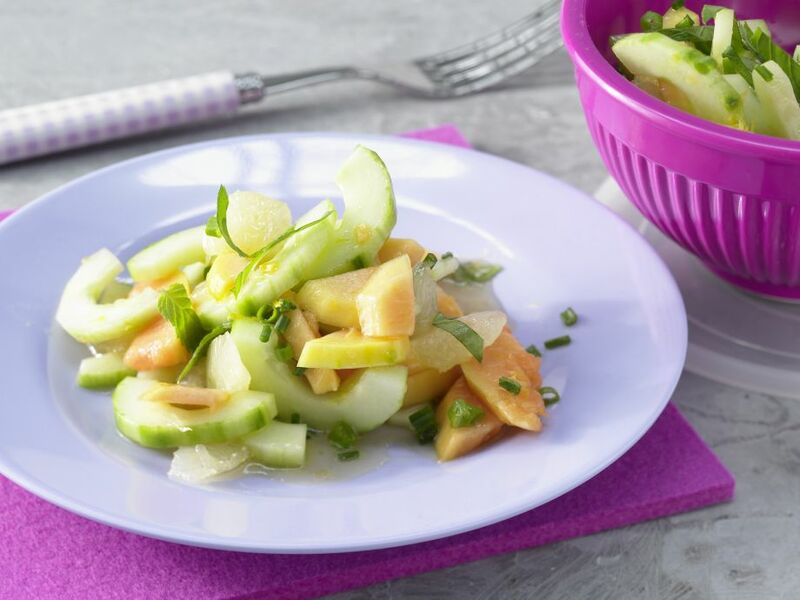 Cut cucumbers into about 5 mm (approximately 1/4-inch) thick slices and add to the bowl with the papayas. 3 Rinse lemons in hot water, wipe dry and finely grate peel. Remove the outer white sections of the lemons and cut the lemon flesh into thin slices. 4 Add the lemon zest and lemon slices to the papaya and cucumber mixture. 5 Mix the honey and olive oil in a small bowl. Pour the dressing over the salad and gently mix. Allow the salad to stand for 15 minutes. 6 Meanwhile, rinse mint and chives and shake dry. Pluck mint leaves and cut into strips. Cut chives into rolls. 7 Add chives and mint to the salad. Season with salt and serve or transfer to a 1.5 liter (approximately 1-quart) capacity storage container for transporting.